and put it in its true historical context. 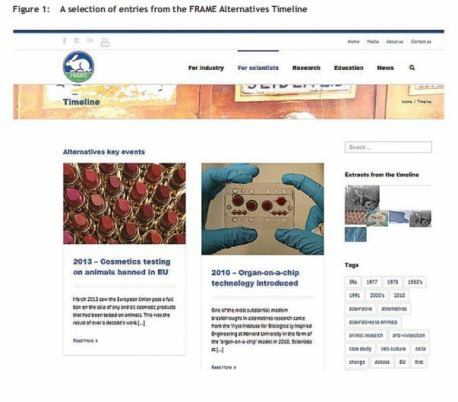 FRAME is very excited about the launch of our new website.1 One of its many new features is the FRAME Alternatives Timeline,2 first proposed in the PiLAS supplement of ATLA issue 41(6). The Timeline is to be launched at the World Congress on Alternatives and Animal Use in the Life Sciences, in Prague, Czech Republic (24–28 August 2014). It summarises major advancements made in all fields of alternatives research (see illustration below), including how they relate to the principles of the Three Rs, as outlined originally by Russell and Burch3 and recently reinforced by the European Union.4 It also includes significant moments in both legislative reform and changes in social perceptions, as they relate to alternatives. At its core, we aim to provide a resource for researchers, students, and indeed any other interested individuals, that is content-rich, has ease of access, and is visually appealing. The current version will be updated dynamically, in order to develop a system that collects, organises and summarises a wide range of previous noteworthy work in replacement, refinement, and reduction, while actively adding new material as it arises. It is integral that the accomplishments of the past are recognised and understood, such that they can benefit those that require them, and furthermore to push progress forward and ensure that vital information is not misplaced. This can be for scientific purposes to advance research, or purely for someone’s own interest to help form their opinion on the alternatives discussion. The Timeline allows the reader to follow the progression of the Three Rs concept through history, from the simplest conceptualisation to the most complex technological innovation. The ability to make the Timeline available online, with a global reach, is imperative to its functionality. We hope that a global audience — whether from developed or developing nations, or from countries with strict laws or relaxed laws on animal use — can benefit from this resource. As a tool for finding initial and introductory-level information on the beginnings of the shift toward alternatives to animal use in research, Three Rs-based legislation, and public opinion up to contemporary developments, the Timeline sets the stage for further detailed investigation. Links that directly connect the reader with primary source material are provided wherever possible. — clearly defining which of the Three Rs is in practice. In the pursuit of improved science and animal welfare, and in the transition away from animal-based models toward non-animal ones, it is important to appreciate how technology and attitudes have changed over time. Additionally, actively keeping track of new developments and recording them in the Timeline will help many searching for the current trends in alternatives. We hope that you take the time to check out and enjoy the FRAME Alternatives Timeline, as well as the FRAME website as a whole.